Recently my husband took a couple of days off of work. It is good to take some days off to just relax, I think. It great to take days off when you have something planned, but sometimes it does the body, mind, and spirit REAL good when you just take the day off with no plans. Just sit around and relax or work on a project. Well, on one of the days he had off he decided to attend one of my Nia classes. I was so excited. It was great to have my hubby there. For a moment I thought I would be nervous, but then I realized that he would be fine and I would just be doing what I always do. And that is what we did. He moved, I led, and we went out to breakfast after. The whole morning was such a wonderful treat to me. It definitely is in a Good Thing worthy of my Goodie Jar! How is your good things jar doing? In Nia we have a lot of acronyms. Seems as if all groups do that. I know in the mortgage business there were many. I know in the world of computers there are a lot. That is just the way it is. In Nia some of ours are FAMSS, OLG, TBW, SEB, and BMES to name just a few. BMES stands for Body, Mind, Emotions, Spirit. We can call these voices or realms. I have recently posted about Spirit. It is not the religious type of spirit, but the school-type or the team-type. It is the part of you that — wheeee! — you just let out! The others are pretty easy to describe, but it is very interesting to allow them into all aspects of Nia. They are each separate and unto their own, yet they are all connected. The body is the physical. How we move, what we sense. If we are open and listening to the body we can learn many things. I know that sometimes I hear but I don’t listen. I might “hear” my body tell me it is tired, but I don’t listen and do something about it because I am busy. It can “tell” me it is tired by how many mistakes I make while typing, or that I keep nodding off while doing something. But sometimes I don’t listen because I want to finish what I am doing. In dance we can hear our body, we can choose to listen and act upon what we hear or we can continue on. We could be moving a certain way and then feel pain (“hear”), and we can listen by giving that pain attention and tweaking our movement to remove the pain from our dance. Also we can just let the body dance and in doing so without thinking it often moves in ways that it needs without our interruption or interpretation. The mind is a powerful voice. It can dictate our entire dance and life if we let it. In Nia we use our mind to provide imagery that allows us to move our bodies in a particular way, but it is important to turn the critical part of our minds off. We use our minds to progress us, not hold us back. Letting thoughts flow through the brain and keeping what is useful in the dance. Criticizing ourselves and others during Nia is not helpful or progressive. We do not avoid moving a certain way because it looks “bad” or “not pretty”. We do not avoid moving because people will think it is silly. We move in safe and harmonious ways to bring FAMSS to our bodies, to relax, to rejuvenate, to allow our inner child out to play, but we don’t criticize. We also practice turning off internal dialog or chatter. We let our bodies dance us and not think about our to-do list. We do use our minds when we dance, but we do not allow it to control our dance. With our emotions we have an almost endless array of energy. We can play with the emotions in our dance and they can provide movement and force. While we dance we do not have to actually FEEL any of the emotions we call upon we just can ACT as if. How would you walk around if you were angry? Might you stomp? How would you walk if you were happy? Might you skip? How would you walk if you were distracted? Might you move slow or in an awkward pattern? Emotions are a great part of Nia because they are feelings and feelings can be felt and/or experienced without taking over. We can allow an emotion to happen or act as if, but in neither case does it have to control our dance. I believe that in 2013 the training material for the Nia Blue Belt is going to change. While it is not changing significantly the change will be significant. 🙂 The ideas will remain the same, but the verbiage and way it is delivered will be updated. While I was attending the Nia Blue Belt Intensive in November of 2012 we were being shown the new slides. The word that was used most often — or that I remember most is – simplify. The idea was to simplify the training. The Nia Blue Belt principle #13 in the manual* shows it as Vertical Routines. We were told it is going to change to Conscious Transubstantiation with Creating a Vertical Body and Life as the tagline. Not a simplification to me, but . . . . there you have it. I will state again as I have been stating in many of my posts about the Nia principles, what I am sharing is somewhat off the top of my head, what I remember being discussed and it barely scratches the surface of each principle. The principles are deep, I could write pages about them alone and the taglines add yet another dimension with even more information. Here I am just sharing a little portion, just one aspect. Now for the purpose of Nia, transubstantiation does not mean the bread and wine will change into the body of Christ. But Nia is using it to mean change and change the body. 🙂 So, maybe that is the tie in and the reason to use that word. Nia is using the term Conscious Transubstantiation to mean consciously change your body to match the body of the teacher. This somewhat ties back to Nia Blue Principle #12, which is funny because that also helps explain the vertical portion. It is common for a participant in a lead follow type of dance exercise class to do the move and follow the leader trying to change at the exact moment the leader changes the move. Even if the leader is excellent at cueing the participant could feel rushed into the next move. Sometimes the participant is concentrating and doesn’t hear or see the next move only to look up and realize they are a step behind or not matching exactly so they rush to catch up and do what the teacher is doing. Well with the conscious change it’s ok not to rush to catch up. Get there when you can. No need to disturb the nervous system and interrupt the flow, just catch the next round or the next step. Consciously changing instead of rushing into the move because that is where you are “supposed” to be. Allowing yourself to change consciously allows for a smooth transition. While this is not exactly the same as Nia Blue Principle #12, it is similar in that you are not having to rush to the next move. The “Vertical” means how things are connected and built upon one another. The Nia Blue Belt Principles are built upon and woven into the Nia White Belt Principles. Nia’s 52 Moves are built upon each other. 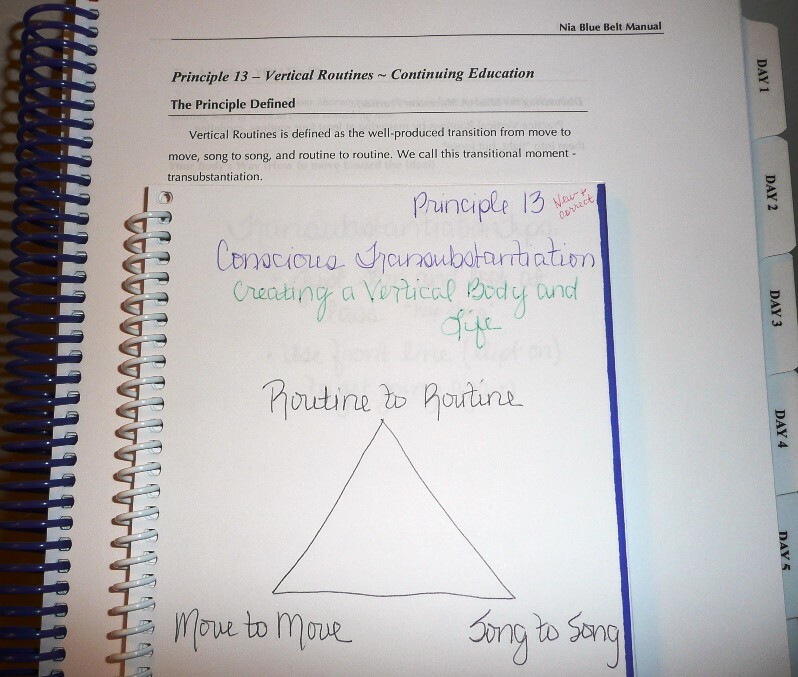 The “vertical” routines speaks to the moves in the a kata and how we change from move to move, the songs in a routine and the transition between the two and even the bigger picture of routine to routine. So . . . in a Nia class you are encouraged to move in your own body’s way and “get to” the next move in your own natural time. The idea is not to upset the body, mind, and spirit by feeling as if you are not doing it right because you are not RIGHT ON the mark of the change as it first happens, Conscious Transubstantiation. Take your time and enjoy the movement and the moment you are in. Allow yourself to change when you are ready enabling you to sense the “vertical-ness” of Nia so your workout can be one of Joy. It might be a challenge to break the habit of interrupting your move to match the teacher when you notice the change, but you might be surprised at the effect it has on your body, mind, and spirit once you do get the hang of it. What do you think? Are you willing to give it a try? Principle #7 of the Nia Blue Belt is “Nia Class Format” with the tagline of “Delivering the Promise”. Before starting to write this post I opened my Blue Belt Manual and started reading what it said about principle #7 and for a moment I couldn’t remember learning anything about the principle in the training. In the manual there is six and a half page table comparing a “Body/Mind/Spirit Teaching Style” to a “Traditional Teaching Style”. I found myself thinking, “well, not any longer”. As in the traditional style is really “old school”. A lot of classes now adopt the formula that has ALWAYS been a part of a Nia class. Nia is different from many other workouts. I believe in the almost 30 years that Nia has been around fitness classes have changed a lot and Nia is not the only one that incorporates a more mind-body approach. Although I say that Nia is more a body-mind approach because Nia actually STARTS in the body. So . . . hmmmm? If other classes are now doing what Nia has always done it goes a long way in showing that it is the better way. self-image of the human being. Individuality Stresses the importance of individuality. Stresses conformity. These are just two examples, as I said there are six and a half pages. And, this table is not saying that every class that is not Nia does the things listed under Traditional Teaching Style. It is just a sample of what some styles are like. I like the table in the manual. I feel it is a great tool. I can see that sometimes I am using the Traditional Teaching Style (neither of the ones previously mentioned) and that is exactly why I wanted to participate in the Nia Blue Belt Intensive. I wanted to work more on “delivering the (Nia) promise”. I had been taught to exercise via the traditional way so that is what I know or knew. I like the reminder of the Body/Mind/Spirit Teaching Style. I also need the reminder because other people have been taught the other way too so that is what they respond best too. It really is up to me to show them the alternative. It is up to me to deliver Nia with the Nia class formula so that they can see that there is another way to workout. This principle is about Body, Mind and Emotion, and Spirit. Nia Blue Belt Principle #3 will assist me with this principle. They are all connected. Two things I want to mention to help clarify, when Nia talks about spirit, it is not in the religious sense, it is comparable to spirit as in “class spirit” or “spirit week”. Ya know, like they do in high schools? It is about the inner “you”, your enthusiasm, what drives you, your “spirit”, not something related to religion. And the other thing, I believe that Nia is working on re-writing, adjusting, and updating the training material. Nia is always working to remain up-to-date. The trainers were working off of slides that were not even final. Are you curious enough yet about Nia to find a Nia class in your area? Do you prefer a Body/Mind/Spirit Teaching Style or a Traditional Teaching Style when you take a class? Don’t you love three day weekends? I remember when I worked a corporate job, three day weekends were looked upon as revered things. I had been in the mortgage business all my working life and for some reason there was a practice of companies closing a bit early the Friday before a three day weekend. Rarely was it announced too far in advance, but just sprung upon us a little before lunch. The management would let us know we would be getting out at 2:00 pm or 3:00 pm. We would get to start our holiday early! Eventually it became such a common practice that we kind of began to expect it. And some companies would even be so kind as to announce the early departure time the day before so that people could actually make plans. Ahhh, yes, the three day weekend is something corporate America loves. Sometimes the actually Holiday is forgotten in the joy of having an extra day off. Forgotten in the excitement of the prospect of gathering with friends. Forgotten in the moment. Usually there is a mention of it somewhere and we say, “Oh yeah, THAT’s why we have an extra day off.” In the case of Memorial Day it really is more than an extra day off, isn’t it? Because of the people who have served and died in the United States Military, we, in America, have so much more than a day off. “The Act moved Washington’s Birthday, Memorial Day, Columbus Day, and Veterans Day from fixed dates to designated Mondays. So it is no wonder we might sometimes forget what the holiday actually was created for, because at one point it DID become about having a three day weekend. I do hope that you take advantage of the time off and I hope you do enjoy yourself. I really believe that having time off from work is necessary to help recharge the body, mind, and spirit. While you are sharing good time with family and friends maybe you can take a minute to remember those that died serving in the military. 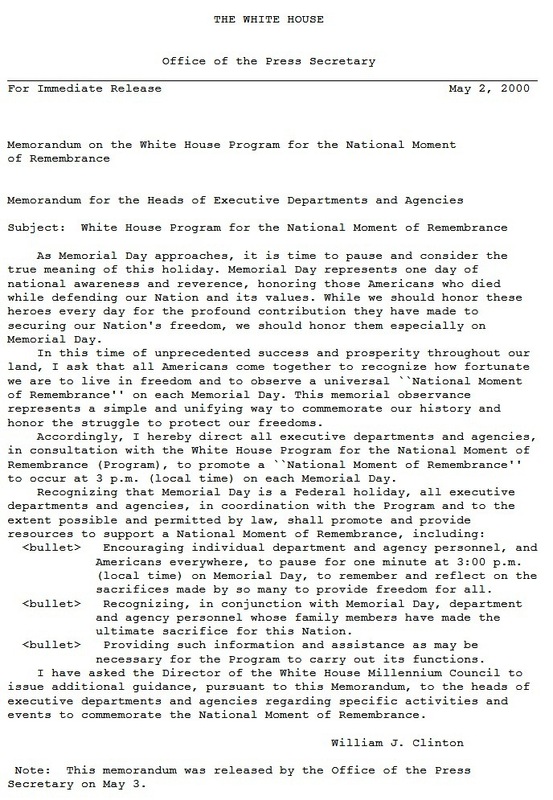 In fact, in 2000 there was a White House Memorandum issued that would be a wonderful thing to participate in. It encourages “Americans everywhere, to pause for one minute at 3:00 p.m. (local time) on Memorial Day, to remember and reflect on the sacrifices made by so many to provide freedom for all.” Will you join me? Since Nia is a workout/dance/practice that recharges the body, mind, and spirit I am not taking Memorial Day off. I will hold both my morning Nia class and my evening Nia class which will allow those that are normally working to participate. The focus will be sacrifice and freedom, the intent will be to express gratitude for the sacrifices made for our freedom. I hope you enjoy your weekend. If you have a three day weekend, I hope you take advantaqge of that extra day off. I also hope you will join me for a minute at 3:00 pm this Memorial Day and every Memorial Day and take a moment to remember.